There is limited evidence to explain the effect of organizational memory on marketing implementation. This paper addresses this gap by identifying multiple components of organizational memory and examining how each affects marketing implementation. Organizational memory is a collective recollection of the past that is embedded within firm culture, procedures, and expertise. The findings demonstrate potential tradeoffs to linking versus locking into the firm’s past, particularly in turbulent environments. 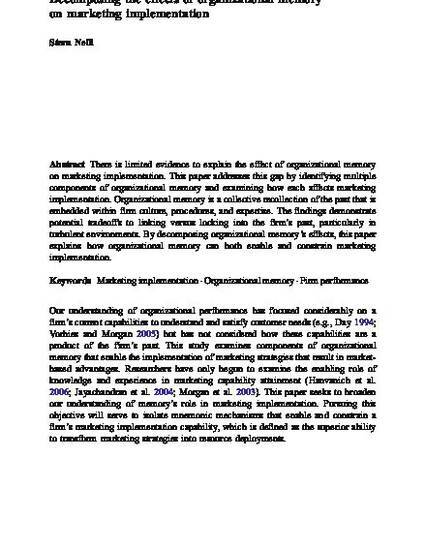 By decomposing organizational memory’s effects, this paper explains how organizational memory can both enable and constrain marketing implementation.